MANILA – After more than two years of not being in the social media sphere, singer-actress Sarah Geronimo returned to the microblogging site Twitter on Wednesday. Using the new Twitter handle @JustSarahG, the popular Kapamilya talent, in her first tweet, said she is happy to be back on the microblogging site. “Hi everyone! This is sarah g. And I'm back on twitter. ” she said. She also invited her loyal supporters to watch her upcoming movie with John Lloyd Cruz in her succeeding tweets. “Iniimbitahan ko po kayong lahat na muling subaybayan ang love story nila miggy at laida. May happy ending nga ba para sa kanila? Sabay-sabay po sana natin alamin. Malapit na... sa March 30,” she tweeted. In just three hours since she first posted her tweet, Geronimo’s account already garnered over 2,500 followers. As of writing, Geronimo is only following 16 people on Twitter including Martin Nievera, Anne Curtis, Yeng Constantino, Jed Madela, Angeline Quinto and KC Concepcion. This is not the first time that Geronimo joined Twitter. On April 8, 2010, the singer already joined the social networking site under the handle @Sgeronimo25. She already earned more than one million followers in that account but her fans were saddened when she decided to leave her first account dormant. Sarah Geronimo is the only Filipina singer nominated in three separate categories of the World Music Awards. The Popstar Princess is nominated in these categories: World’s Best Female Artist, World’s Best Live Act and World’s Best Entertainer of the Year. According to its official website, the World Music Awards started in 1989 and its goal is to "honor the best-selling recording artists from every continent. "The World Music Awards are presented on sales merit and voted by the public on the internet. “There is no jury involved and the Awards truly reflect the most popular artists as they are determined by the actual fans who vote and buy the records." To explain how the nominees were chosen, the website indicated: "The national member groups of the International Federation of the Phonographic Industry (IFPI) provide the organization with the names of the best-selling artists from the major territories." In the World’s Best Female Artist category, Sarah is competing against international artists such as Adele, Jennifer Lopez, Katy Perry, Lady Gaga, Madonna, Rihanna, and Taylor Swift, among others. In the Best Live Act category, Sarah is pitted against Britney Spears, Justin Bieber, Nicki Minaj, One Direction, Kpop group Shinee, and Celine Dion, among others. In the Best Entertainer of the Year category, Sarah has to compete against Beyonce, Bruno Mars, Christina Aguilera, Ne-Yo, and Celine Dion, among others. The other categories in the World Music Awards include World's Best Male Artist, Best Group, Best Electronic Dance Music Artist, Best Song, Best Album, and Best Video. This piece is not meant to give a chronological listing of achievements by and recognitions given to Sarah Geronimo. But I’m writing from the perspective of an 18 year old teenager–which I was then–who saw a contestant by chance on a talent show on TV while changing channels. I thought she showed so much talent, had that elusive ”IT” factor, and had such an enchanting appeal about her that was hard not to notice. That was in 2003. I recall sitting in my room watching TV and seeing a young teenage girl delivering an astounding performance and a thought crossed my mind: “If she wins, she will become a big star someday. If she survives all the politicking in showbiz, then she will certainly become one of the best ever.” That performance of hers got me excited again about the probabilities of having new artists under the OPM banner. Here was a young girl named Sarah Geronimo, a name that I hoped we would all know one day. When I saw “Asia’s Songbird” congratulate and hug Sarah Geronimo who won the competition, that right there for me, felt as if time stood momentarily still. It was like I was witnessing the “passing of the torch” to Sarah Geronimo. And in my eyes, I felt this was that very moment that signalled things were about to change in the landscape of OPM. And more importantly, it started the introduction of “new blood” into our selection of available mainstream singers in OPM. That was the time to make things happen and to bring about much change that I believed was needed for OPM to flourish once more. Looking back at that eventful moment, it brought a whole new meaning to me. I wonder just how many other Filipinos felt also how significant that moment was? One of the things I notice now when I watch game shows, reality talent shows, and noontime shows is that when the host asks the participants who they look up to or idolize as a singer, most of the participants include Sarah Geronimo’s name in their list. That is a change for the better in the right direction because it is no longer the same names that we usually heard. The first time I had heard Sarah Geronimo’s name mentioned by a participant in a singing competition as an influence and inspiration, it was refreshing to hear and it was a welcome surprise. It meant that Sarah Geronimo had finally broken through the proverbial “glass ceiling” and entered the consciousness of young Filipinos aspiring to be singers one day! By her own example, she showed them to dream big, too. I had always felt that Sarah Geronimo was treated like a “frozen delight” in the first network she was in. I was so, so dissapointed. Why weren’t they utilizing her more then? Why wasn’t she appearing or guesting in more shows? Why wasn’t she a regular mainstay in their Sunday noon show? These questions were racing in my mind. Even as an observer, these ”none” developments frustrated me. Why were these happening to her? It was as if all the anticipation and excitement to see her perform on a more regular basis on television was starting to fizzle away. It made me think if all above were being done, in fact, to make people forget about Sarah Geronimo? Was it because some people were intimidated by her presence? After a year in limbo on that network, I’m just happy that she finally found a network that wouldn’t waste her talents but nurtured them–not only singing, but acting and hosting, as well. You can’t put a good person down and there will always be people who would look after you and allow you to grow. Sarah Geronimo blossomed and excelled in the network she has been a part of for 9 years now. The path has been cleared for her and we have seen how Sarah Geronimo has blossomed from that young girl to now earning the title “Pop Princess” which she rightfully deserves. Sarah Geronimo, to me, represents a “modern take” on the traditional Filipina lass–truly, “isang tunay na dalagang Filipina sa panahon ngayon.” Her reputation has remained unsullied despite her being an established and respected name in OPM. Her coy, yet charming mannerisms, and her almost modest comportment in her beautifully crafted costumes even as she performs on stage, bespeak of her well-grounded Filipino values. In my opinion, she is someone that the youth can also look up to and is a perfect female role model for other young aspiring singers. MANILA, Philippines -- After a decade in showbiz, Sarah Geronimo admittedly is only starting to learn how to balance being the country's "Pop Star Princess" and a 24-year-old daughter behind the camera. In a one-hour, uncut interview released online early this week, the Kapamilya singer-actress spoke at length about her struggles as a "public figure" and simply "being Sarah Geronimo." The interview, where she appeared alongside "It Takes a Man and a Woman" co-star John Lloyd Cruz, was first aired last month on the entertainment talk show "Showbiz Inside Report" as an 18-minute segment, but excluded parts where Geronimo addressed questions on her "struggles" in her decade-long career. One question posed by "SIR" host Carmina Villaroel pertained to the singer's difficulty being "judged" as one of the country's most popular artists: "Maraming naka-witness sa journey ninyo, so personal niyong buhay at sa career ninyo. Maraming intriga na ang napagdaanan ninyo. Gaano kahirap maging Sarah Geronimo?" Geronimo responded: "Ako, honestly mahirap, mahirap po. Kasi nandoon 'yung struggle mo na, sino ba talaga ako?" "Sino ba talaga si Sarah Geronimo na nakilala nila ng 10 years dito sa business na 'to? Sino si Sarah Geronimo na anak ni mommy, ng mga Geronimo? At 'yun 'yung palaging nagtatalo -- becoming my real self at kung ano 'yung gusto ng taong makita sa akin. May struggle doon," she said. The singer-actress, who first rose to fame after winning the singing contest "Star for a Night" in 2003, added that her years in showbiz have helped her in finding her "true self." "Merong positive na nabibigay, kasi parang 'yun 'yung guide mo to become a good person. In a way, magulang mo sila, 'yung career na meron ako ngayon," she said. Admitting that she is still a "work in progress," Geronimo said she is slowly discovering her "identity," but is still far from being able to define herself. "Mahirap! Masyadong mahirap sabihin muna ngayon," she said. One turning point, Geronimo recalled, was when she was forced to come to the defense of her parents, specifically her mother Divine Geronimo, who became the target of criticisms for allegedly "preventing" the singer from having any romantic relationship. "Hindi lang naman [para sa akin]," the Kapamilya actress said of "speaking up." "Kasi 'yung parents ko rin eh, sobra na silang, bina-bash na, sobra na. 'Yun 'yung talagang nag-trigger na, 'Ah, ganoon ah. Teka muna.'" "May conclusion na sila eh, na, 'Teka muna, hindi niyo po alam kung ano ang totoong nangyari,'" she added. Asked what she feels is the most hurtful comment made against her parents, Geronimo paused, before saying, "Ayoko na pong anohin, huwag na lang po." Although her being in the limelight exposed her family to intrigues, it is the same career that Geronimo credits for providing them with a more comfortable life. On what she considers to be an "unforgettable" effort she has done for the benefit of her family, Geronimo said, "Ako kasi po hindi ko siya binibilang. Lagpas lang. Hindi ko nga naiisip." "[Iyong pagbibigay-saya sa pamilya ko] naman 'yung main reason talaga kung bakit ako pumasok sa show business," she said. Geronimo recalled that as an aspiring singer, she felt like giving up after numerous failures, but was pushed to continue pursuing a career in showbiz to escape poverty. "Gusto ko na po talaga bata pa lang ako, pero dumating 'yung time na wala na gusto ko na magi-give up kasi wala namang nangyayari. Pero nung nakita ko na sobrang hirap na hirap na kami... Para sa pera kung bakit ako sumali sa contest," she said. Admittedly, however, being "Pop Star Princess," whose achievements have also been recognized internationally, comes with a price. "Siyempre mahirap po mag-artista, public figure. Mahirap, maraming kapalit," Geronimo said. At times when she feels overwhelmed by work and certain intrigues, Geronimo said she tries to remind herself of the comforts her career has afforded her over the years. "Minsan nakakalimutan mo 'yung mga small things. Hindi [lang] small things, 'yung talagang malaking pagbabago sa buhay mo. Dati mahirap kayo, wala kang makain, walang pambili ng shampoo, toothpaste, pamasahe. "So 'yun na lang 'yung titingnan mo po kapag malungkot ka o depressed ka," she said. Amid her immense success in the industry, Geronimo said she is careful not to compromise her values. She also expressed thanks to her parents, who she credits for the sound advice on handling her being a public figure. "[Ang advice nila], 'Don't let fame change you.' Itong show business na ito, pwede niyang baguhin ang values mo, ang pananaw mo sa buhay, sa kahit ano. At mahirap iyon, kasi mahirap i-please ang mundo at ang Diyos nang sabay," she said. If Sarah Geronimo is not as visible as her leading man John Lloyd Cruz, who is on TV most of the time thanking everyone who watched “It Takes a Man and a Woman,” it is reportedly because she is in Paris with her mother. They are there to visit a sister of Sarah who is reportedly based there. Another sister resides in New York. It is just a brother and Sarah who live with their parents in their home in a subdivision in Quezon City. When Sarah comes home, she will be busy with two TV shows. One is a drama anthology, and the other is the reality singing show, “The Voice Philippines,” where she will sit as one of the judges, together with Lea Salonga, Bamboo and international Filipino singer Apl de Ap. Masayang-masaya si John Lloyd Cruz dahil patuloy pa ring pinipilahan sa mga sinehan ngayon ang pelikula nila ni Sarah Geronimo na It Takes A Man And A Woman. Tinatayang umabot na sa 300 milyon na ang kinita ng nasabing proyekto ngayong araw. “It’s been overwhelming magmula ng first day, pero di pa rin nawawala ‘yung kaba. Na-intrigue pa rin ako sa moviegoers, inaantay ko kung ano ang mangyayari in the coming days. Marami pang hindi nakakapanood, sana huwag palampasin ng mga tao,” bungad ni John Lloyd. Sarah nagno-nosebleed sa kaka-English, intimidated kina Lea, Apl, at Bamboo; Panliligaw kay KC inamin din Apl.de.Ap, pinakamahal ang TF sa The Voice! MANILA, Philippines - Si Sarah Geronimo lang ang nagta-Tagalog sa apat na coach ng The Voice of the Philippines. Syempre slang at inglesero ang mga kasama niyang sina – Apl.de.Ap, Lea Salonga and Bamboo. Kaya naman dinadaan na lang ni Sarah sa tawa at biro. Pero aminado siyang intimidated talaga siya sa mga bigatin niyang kasama sa talent show na mag-uumpisa na sa Hunyo. “Hindi n’yo po alam kung gaano kalakas ang kabog ng dibdib ko. Dinadaan ko lang sa pa-Ingles-Ingles na barok,” natatawa niyang sabi kahapon sa presscon nilang apat. Biro pa niya nagno-nose bleed siya sa tatlong kasama. “Magta-Tagalog po ako rito. Si Apl.de.Ap at si Lea, talagang hindi na masyadong ini-expect na magta-Tagalog, pero slang din pala si Bamboo na ang sabi’y lumaki sa Amerika. Going back to Sarah, nakaka-relate si Sarah sa The Voice dahil aminado naman siyang dumaan siya sa maraming auditions bago siya nagkaroon ng pagkakataon na manalo sa isang contest. Nabanggit din niyang willing siyang sundan pa ang pelikulang It Takes A Man And A Woman, ang movie nila ni John Lloyd Cruz na balitang nakaka-300 million na. “Gusto ko pong ulitin ang sinabi ni John Lloyd na kung makakapag-come up kami ng better script doon, why not? Kasi maganda po namin siyang natapos. Ang ganda po ng istorya ni Laida at Miggy, sinuportahan sila. Basta naniniwala ako na magagawa namin kung may maganda pang material,” paliwanag ng Pop Princess. Anyway, magsisimula ang kumpetisyon sa The Voice of The Philippines sa isa-isang pag-awit ng mga lalahok sa blind auditions kung saan pipili ang coaches kung sino sa mga sasalang ang nais nilang mapabilang sa kanilang team para i-mentor. Sa oras na sila ay makapagpasya ay pipindutin nila ang kanilang button na siyang uudyok sa kanilang swiveling coaches’ chair para umikot paharap sa entablado at para na rin masilayan na nila ang mukha sa likod ng ginintuang boses na kanilang napili. Kapag mahigit dalawang coach ang pumili sa isang artist, kinakailangan nilang magdebate at kumbinsihin ang artist na sila ang piliing coach nito. Matapos mapili ang mga miyembro ng kani-kanilang koponan ay magsisimula na ang mga coach sa pag-mentor at pagsasanay sa kanilang mga artist at pagbabanggain ang dalawa sa mga ito sa ikawalang round na tinatawag na “battle rounds.” Dito ay magpapatalbugan ang mga artist sa battle stage at ibibigay ang lahat para mapabilib ang kanilang coach na siyang gagawa ng malaking desisyon kung sino sa kanila ang papauwiin at sino sa kanila ang uusad sa susunod na round ng kumpetisyon— ang live performance shows. Sa round na ito papasok ang kapangyarihan ng sambayanan dahil maari na nilang iboto ang kanilang mga paboritong artist at salbahin ito mula sa eliminasyon. Sa grand finals, bawat coach ay may isang manok na lang na ilalaban sa kantahan sa pambato ng kalabang coaches at isa lamang sa apat na grand finalists ang kikilalaning The Voice of the Philippines. Sasamahan ng The Voice Philippines ang 40 iba pang bansa na gumawa na rin ng sarili nilang bersiyon ng The Voice sa telebisyon kabilang na ang popular na US version na pinangungunahan ng host na si Carson Daly at kinabibila­ngan nina Christina Aguilera, Adam Levine, Cee Lo Green, at Blake Shelton bilang coaches. Sino ang mapapabilang sa Team Sarah, Team Bamboo, Team Lea, at Team Apl? Ay may tinanong nga pala kami kung sino sa apat ang may pinakamahal na talent fee? Walang kakurap-kurap na sagot niya, siyempre si Apl.de.Ap bilang siya ang may international status sa kasalukuyan. Meron din naman siyempre si Lea, pero base sa sagot nang tinanong namin, ang dating member ng Black Eyed Peas na nagpasikat ng maraming­ kanta ang may pinakamalaking bayad sa kanilang apat. At inamin nga pala ng hiphop sensation na nanligaw siya kay KC Concepcion. Pero tumigil daw siya nang malamang karelasyon nito si Piolo Pascual. Balita pa noong binigyan niya ng necklace ang anak ni Megastar Sharon Cuneta. MANILA – The third installment in the series of romantic-comedy films starring John Lloyd Cruz and Sarah Geronimo is poised to become the second highest grossing Filipino movie after only two weeks in theaters. "It Takes a Man and a Woman" is now on track to bump off the comedy flick "The Unkabogable Praybeyt Benjamin" as the second all-time highest grossing local film, after it earned at least P300 million within its first two weeks in cinemas nationwide. The box-office figure was disclosed Saturday on micro-blogging site Twitter by Star Cinema advertising and promotions manager Mico del Rosario. Starring Vice Ganda and directed by Wenn V. Deramas, "Praybeyt Benjamin" reportedly earned P331 million during its theatrical run in 2011. It places second in terms of total box-office earnings to another Deramas film "Sisterakas," which featured the trio of Vice Ganda, Kris Aquino and Ai Ai delas Alas as lead stars. Released as an entry to the 2012 Metro Manila Film Festival, "Sisterakas" reportedly earned P391 million during its run in cinemas nationwide, making it the all-time highest grossing Filipino film. All three top-grossers -- "Sisterakas," "Praybeyt Benjamin," and "It Takes a Man and a Woman," in order -- are co-productions of Star Cinema and Viva Films, which will both be given the Most Popular Film Producers recognition at the 44th Box-Office Entertainment Awards. Cruz, who will be given the Box Office King title by the same award-giving body on May 19, earlier said it is "difficult to say" whether "It Takes a Man and a Woman" will manage to beat the record of "Sisterakas." "Hindi ko alam, mahirap sabihin, because when 'Sisterakas' was shown, ano 'yun eh, film fest. Ngayon, matindi pa ang competition, ang daming summer big movies na paparating habang magpe-play kami, so I don't know. "Hindi ko alam kung ano mangyayari, pero siyempre andoon 'yung... umaasa tayo na magtuluy-tuloy," he said. Due to the massive success of "It Takes a Man and a Woman," both Cruz and Geronimo have been asked whether a fourth film featuring their characters Miggy and Laida is planned to be produced. Following the box-office successes of "A Very Special Love" (2008) and "You Changed My Life" (2009), the third big-screen installment, which was also directed by Cathy Garcia-Molina and written by Carmi Raymundo, has been referred to as the conclusion of the Miggy-Laida love story. While both Cruz and Geronimo have expressed willingness to do yet another sequel, both Kapamilya stars said it will be at the condition of having "a good script and material." MANILA – Sarah Geronimo played down the statement of her leading man John Lloyd Cruz when he said she made him "want to sin" the first time they worked together for a movie. “Doon ako nadali ni Sarah, ng magic niya, ng charm. Iba siya, iba talaga. In the movie, she made me want to sin. Ang bigat noon, pero kinaya ko,” Cruz said. But Geronimo tried to de-emphasize Cruz's telling statement in her live interview with “The Buzz” on Sunday. “Si Lloydie, siya 'yung taong mabilis matuwa, ma-endear sa isang tao. Sa tingin ko iyon lang iyon,” she said. Regardless of this, Geronimo thanked Cruz for all the achievements that they have shared in their series of romantic-comedy movies. “Thank you, thank you so much at nagkasama tayo ulit at na-restore din ang ating magandang pagkakaibigan,” she said. Cruz, for his part, told Geronimo that he will always just be there for the singer-actress even as they await their next project together. “Sars, thank you for the opportunity, for the friendship. Sana it doesn’t end here. Sana hindi siya matapos and from my end, alam mo naman na I’ll always be here. You’re very special to me. Maraming, maraming salamat na ako ito at ikaw iyan. Thank you,” he said. While many are hopeful that there will be fourth movie for their characters as Miggy and Laida, Cruz is positive that he and Geronimo will again share the big screen in the future. “Definitely magkakatrabaho pa kami. This is not the end for me and Sarah. Malabo iyon, imposible iyon. I can’t wait to see the next material for me and Sarah,” he said. After earning P345 million in less than three weeks in cinemas nationwide, the Sarah Geronimo and John Lloyd Cruz-starrer “It Takes a Man and a Woman” is now officially the second highest-grossing Filipino film of all time and the biggest earning non-Metro Manila Film Festival (MMFF) local movie. The third installment of the hit romantic-comedy film series directed by Cathy Garcia-Molina broke the record of the comedy flick “The Unkabogable Praybeyt Benjamin” starring Vice Ganda, which earned P331 million during its theatrical run in 2011. “It Takes a Man and a Woman” is now second in terms of total box-office earnings after the 2012 MMFF entry “Sisterakas” starring the comedy trio of Vice Ganda, Kris Aquino and AiAi delas Alas, which raked P391 million during its run in cinemas nationwide. All three top-grossers– “Sisterakas,” “The Unkabogable Praybeyt Benjamin,” and “It Takes a Man and a Woman”–are co-productions of Star Cinema and Viva Films. Meanwhile, “It Takes a Man and a Woman” screenwriter Carmi Raymundo recently revealed that the much talked about wedding vows of Laida and Miggy that made everyone in cinemas cry were written by Sarah and John Lloyd themselves. 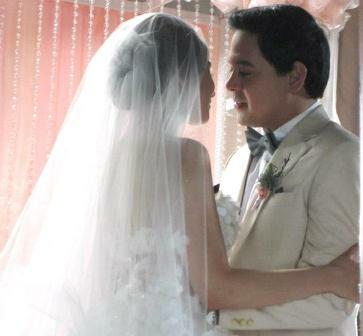 Carmi further shared that Sarah and John Lloyd’s self-made vows were so beautifully written that she almost did not edit it. “Konti na lang ang inayos ko. Their vows made the ending of Laida and Miggy’s love story a thousand times more special because they spoke their own words. As a writer, yun na ang gift ko sa kanila: to let them speak their own words. In the end, parang naging buhay na talaga sila Miggy at Laida,” Carmi related. Continue to fall in love with Laida and Miggy’s love story in “It Takes A Man And A Woman” still showing on theaters nationwide. [ABS-CBN] Sarah Geronimo says variety show helped her mature as a performer and "as a girl who is now a woman." "Hindi po naging madali ang pagbuo ng Sarah G Live. Makulay ang journey," says Sarah Geronimo about her musical-variety show that won the Best Variety Show in the 21st Golden Dove Awards. She admitted that working on Sarah G Live helped a lot not only in her career but also her development as a person. also as a person and as a girl who is now a woman. Naks!" She then let out her trademark giggle. akin simula pa noong ASAP. Kaya binabahagi ko rin po ang award na ito sa aking ASAP family. Kilala ang ina ni Sarah Geronimo na si Mommy Divine sa pagiging mahigpit nito sa mga anak lalo na sa Pop Princess. Aminado naman si Sarah na may mga pagkakataon na kinukuwestiyon na rin niya ang sariling ina pero nauunawaan naman niya ito. “There was a time na parang confused ka rin. So, parang sana, malampasan ko na ’yung stage na ’yun. ’Yung naiisip mo sobra ba silang protective? Ano ba ang dahilan? Bakit ganito? Bawal ’yung ganito, bawal ’yung ganyan-ganyan. Pero as I age, as I experience things, as I experience pain, naiintindihan ko kung bakit ganun siya. “At nagpapasalamat ako ng sobra-sobra na ganun siya ka-protective. May nakita pa kong ibang mothers na mas istrikto pero si Mommy hindi. Sobra niya lang kami talagang mahal,” paliwanag ni Sarah. Samantala, abala na ngayon ang dalaga para sa bagong reality show na The Voice of the Philippines at kakaibang Sarah ang kailangang abangan ng lahat dito. “Itong pagiging coach ko sa The Voice is a big challenge for me kasi kumbaga ’di na ako ito eh, ’Di ko na ‘to istorya. ’Di ko na ’to boses. Boses na ‘to ng mga tao na nangangarap. So, in charge ka sa victory nila eh. Ang masakit nun, siyempre may Battle Rounds na, kailangan na mag-eliminate sa team ko, masakit,” paglalarawan ng singer. Makakasama ng dalaga bilang mga coach din sa programa sina Lea Salonga, apl.de.ap, at Bamboo. Isang malaking karangalan para kay Sarah ang maihilera sa mga ito. “Actually, nakaka-intimidate po talaga. Tuwing taping day namin nilalabanan ko talaga ‘yung intimidation. Pero nilalakasan ko na lang po ’yung loob ko,” pagtatapat niya. One of the country’s largest property developers, SM Development Corporation (SMDC), announced just last month that they chose Popstar Princess Sarah Geronimo to be one of their brand ambassadors alongside their long-time endorser Anne Curtis. According to SMDC, while Anne targets the A,B, and C market, they would love to have Sarah’s “girl-next-door” appeal to tap on the mass market. "We are proud to have two of the country's most popular, loveliest, and most sought-after brand ambassadors to represent our brand. Anne Curtis and Sarah Geronimo. Five Stars!" Anne even welcomed Sarah on the day that SMDC announced the singer’s new involvement with the huge company. “Welcome to the SMDC Family my favorite popstar @JustSarahG Viva and SMDC sisters!” Anne tweeted. It seems like we’ll be seeing more of Anne and Sarah on TVCs, billboards, buses, and other advertising media real soon!